His face is fairly handsome and pretty symmetrical. Death mask of Napoleon, taken a day and a half after he died on the island of St. Helena at age 51. His eyes are closed, lips slightly parted, and his shaven head is tilted backward, resting on a pillow garnished with a tassel at each corner. 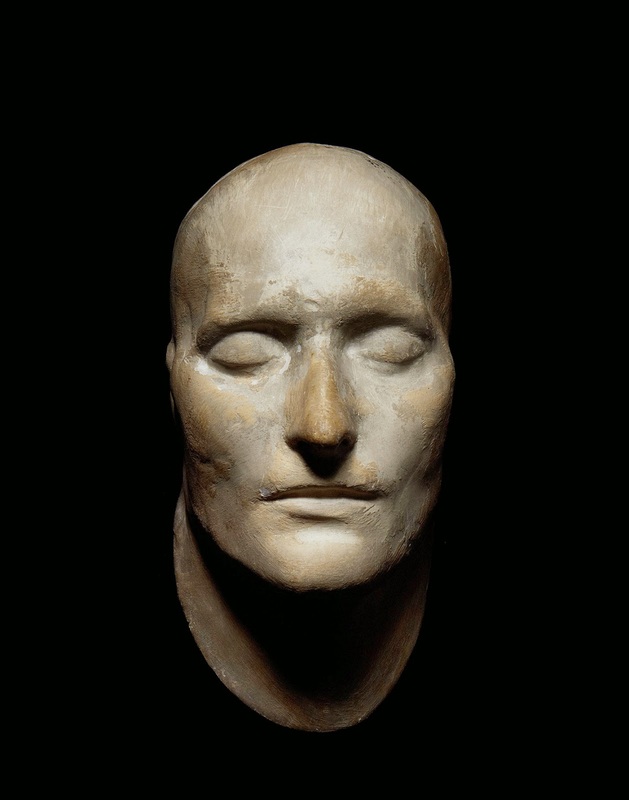 Napoleon’s original death mask was created on May 7, 1821. Surrounding his deathbed were doctors from France and Britain. During the time of Napoleon Bonaparte, it was customary to cast a death mask of a great leader who had recently died. A mixture of wax or plaster was carefully placed over Napoleon’s face and removed after the form had hardened. From this impression, subsequent copies would be cast. Contrary to some accounts of Napoleon’s death, it was not Dr. Antommarchi who made the original mask or so-called “parent mold”; it was the surgeon Francis Burton of Britain’s Sixty-Sixth Regiment at St. Helena. Napoleon was a charismatic and stylish leader in his day. His face is fairly handsome and pretty symmetrical. Painters like Jacques-Louis David said they were “struck by Bonaparte’s classical features” but he rarely sat for portraits, which is why many of the most famous images of Napoleon weren’t accurate studies of his visage. Most portraits artists had to base their work on extrapolations from other paintings or busts, rather than the man himself. He didn’t seem to care, though, as long as the right message was there in the commissioned art. Napoleon died of stomach cancer so he would’ve lost weight but beyond that, this death mask is way more representative of what he looked like versus what a painting would represent him as. The artists were well-known at the time for embellishing in a positive manner how very powerful and rich people looked in paintings. Napoleon wasn’t as short as he was made out to be in history books. Historians suggest he was 5’6″ to 5’7″ (1.68 m) whereas the average height of a Frenchman was 5’6″ at the time. Glory of one man at the cost of the life of many others : 1.700.000 French dead to let a weak and smaller country and millions more European deaths . Does the glory of one man WORTH the life of millions ? I don't agree . That year in June there the anniversary of Waterloo and the end of French Revolution because of a mad tyran thirsting of blood and glory and others else expense . goodness.. you are confused blaming the French Revolution on Napoleon. It was Robespierre who reined in the Reign of Terror NOT Napoleon.